THIS WAS JUNE 29, 2015. "McKenzie couldn't help but celebrate the conjunction of Venus and Jupiter,"explains photographer Mark Marquette. "It was breathtaking." Anyone can have a similar experience in the nights ahead. Just step outside after sunset and face west. Venus and Jupiter are less than a degree apart. Don't wait until the sky fades to black. 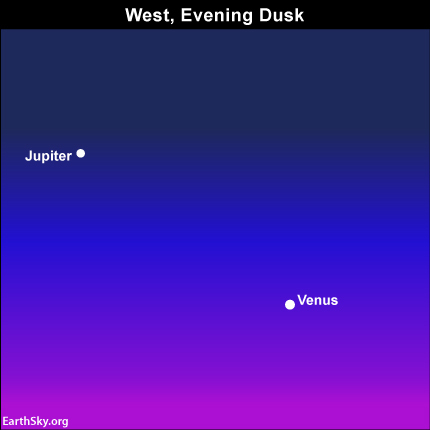 A tight conjunction of Venus and Jupiter framed by twilight blue has a special beauty that you won't want to miss. The night of closest approach is June 30th, when Venus and Jupiter will be only 1/3rd of a degree apart. If you have binoculars or a small telescope, point them at the planets. Both will fit in the same field of view, allowing you to see the fat crescent phase of Venus and the moons of Jupiter simultaneously. It's a great way to end the day. ON any night in June, 2015, look for the queen and king of planets – dazzling Venus and bold Jupiter – as these two worlds appear in your western sky first thing every nightfall. They’ll appear in your evening sky throughout June 2015, and they’ll be drawing closer together each evening! Venus will pass Jupiter in late June/early July, 2015. At that time – especially on the nights of June 30 and July 1 – you can witness the closest Venus-Jupiter conjunction until August 27, 2016. These very bright worlds will be hard to miss (unless it’s cloudy!) because Venus and Jupiter rank as the third-brightest and fourth-brightest celestial bodies, respectively, after the sun and moon. 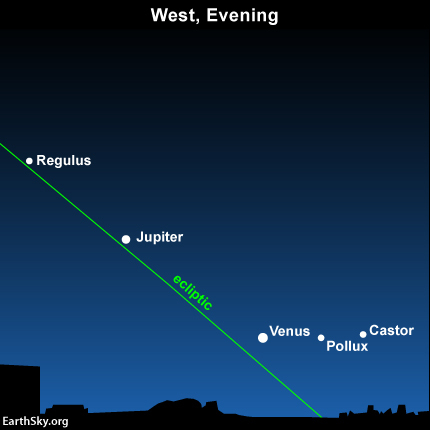 As dusk turns into darkness, note the star Regulus above Jupiter, on line with Venus and Jupiter. Day by day, watch as Venus and Jupiter race toward Regulus, the brightest star in the constellation Leo the Lion. In fact, you can use these three luminaries – Regulus, Jupiter and Venus – to imagine the ecliptic crossing the sky with your mind’s-eye. The ecliptic is the Earth’s orbital plane projected onto the sky’s dome. Because the planets orbit the sun on nearly the same plane that Earth does, the solar system planets are always found on or near the ecliptic. At present, the planets Venus and Jupiter are both heading eastward (upward) along the ecliptic, toward the star Regulus. You might think Jupiter should get to Regulus first, since the king planet lodges so much closer to Regulus, the only 1st-magnitude star to sit almost squarely on the ecliptic. However, the closer that a planet resides to the sun, the faster that the planet travels in its smaller orbit. Venus, the second planet outward from the sun, races along at 35 kilometers per second whereas Jupiter, the fifth planet outward, plods along at 13 kilometers per second. But that’s not all. Jupiter’s orbital path is a solid seven times longer than that traveled by Venus. For that reason, Venus will zoom toward Regulus day by day, whereas Jupiter will travel at a snail’s pace. Be sure to circle July 18, 2015 on your calendar as well. Venus will be almost in conjunction with Regulus, a slight bit ahead of Jupiter in the great race to the constellation Leo’s brightest star. On July 18, the crescent moon, Venus and Jupiter will all fit within a circle sporting a diameter of less than four degrees. (Four degrees of sky approximates two finger-widths at an arms length.) Don’t miss out on this close-knit celestial grouping on July 18, featuring the moon, Venus and Jupiter – the brightest, second-brightest and third-brightest orbs of nighttime, respectively. 12-15-98 - When I went to bed last night and turned off the bedroom light, I noticed a bright light shining on my pillow right where I was going to lay my head. I must have seen this light hundreds of times before, because it was the light from the yard across the street on a tall pole. We have one of those big blue lights too, perched high on the house that comes on automatically when it gets dark outside and shines in every direction to provide us all with a sense of safety. Our light shines into our neighbor's yards like our neighbor's light shines into ours. during the night, our outside world is bathed in a blue glow from those lights. Our other nieghhbors, in turn, also have these large blue lights. Our world is never dark. When I closed my eyes after my head lay gently on my pillow, I immediately saw a web page titled, "The Christmas Light." The house and trees in our neighborhood these days are also aglow with multiple white and colored lights festooned everywhere and people drive around to see each other's Christmas lights. But the original Christmas had it's own blue light...The Star of Bethlehem. The web page I was seeing in my mind's eye then showed me a photograph of a Hindu man, holding in his arms...a baby...not the baby Jesus, but a seven-headed being with a skinny body. It was most grotesque to see. I wondered what that had to do with the Christmas light. I came to find that there indeed was a seven headed being responsible for our creation, and without it this world would have no Christmas light. I present these so-called myths and stories below. The Biblical account of this story is brief, unclear, and subject to multiple interpretations. So meager is the independent historical confirmation that it's hard to defend the view that the Christmas star is anything more than a fictional or metaphorical fable invented well after the time of the alleged events. Certainly every physical explanation has serious difficulties. Such speculations have negligible scientific or historical value. 'Bethlehem in the land of Judah, you are by no means least among the rulers of Judah; for out of you shall come a ruler to be the shepherd of my people Israel.'" Then Herod summoned the astrologers to meet him secretly, and ascertained from them the exact time when the star had appeared. He sent them to Bethlehem, and said, "Go and make a careful search for the child, and when you have found him, bring me word, so that I may go myself and pay him homage." After hearing what the king had to say they set out; there before them was the star they had seen rising, and it went ahead of them until it stopped above the place where the child lay. They were overjoyed at the sight of it and, entering the house, they saw the child with Mary his mother and bowed low in homage to him; they opened their treasure chests and presented gifts to him: gold, frankincense, and myrrh. Then they returned to their own country by another route, for they had been warmed in a dream not to go back to Herod. Uncertainties in the times of Herod's orders to kill all boys under two years of age, the Holy Family's stay in Egypt, the death of Herod and for which census Joseph went to Bethlehem make it difficult to fix the date of the birth of Christ. Who were these Magi? Where did they come from? Magi is the plural of Magus, the root of our word magic; "court astrologer" is probably the right translation. "Wise men" is also a good term, descriptive of the esteem in which they were widely held. The group of Magi in question (it is the Christmas carol, not Matthew, that refers to three of them) came "from the east." They might have been Zoroastrians, Medes, Persians, Arabs, or even Jews. They served as court advisors, making forecasts and predictions for their royal patrons based on their study of the stars, about which they were quite knowledgeable. Magi often wandered from court to court, and it was not unusual for them to cover great distances in order to attend the birth or crowning of a king, paying their respects and gifts. It is not surprising, therefore, that Matthew would mention them as validation of Jesus' kingship, or that Herod would regard their arrival as a very serious matter. A major key to the chronology is the date of the death of Herod, who figures prominently in our story. Herod was alive when the Star of Bethlehem appeared and the commonly quoted date for his death is 4 B.C. (4) Thus dates of 7 B.C through 4 B.C. are often given for the birth of Jesus. The political events of this period are best known from the writings of Josephus Flavius, the Jewish historian who lived from 37 A.D. to about 95 A.D. His testimony has always been considered vital in determining these dates. But the accounts of Josephus and the entire history of this period have been reassessed recently, with important new results, by Ernest Martin, whose book, _The Star that Astonished the World_, has become the authoritative source on the subject. In the meantime, word arrived from Rome that Herod had the Emperor's permission to execute his rebellious son Antipater, and he promptly complied. Five days later he died, but not before decreeing that his was to be the biggest funeral ever held in the history of the world. His body was embalmed. The army was assembled to carry his body in the funeral procession to a burial site some 25 miles away. The soldiers walked in bare feet, as was required when in mourning, traveling one mile a day. A legate from Rome, where word of Herod's death had been received, arrived to protect the royal treasury. Finally, Herod's son Archelaus was crowned king and had time to issue a few decrees prior to the celebration of Passover. The 29 days between the eclipse of 4 B.C. and the following Passover simply do not allow enough time for all of this to have happened. A minimum of ten weeks would have been required. But on January 10, 1 B.C., there was a total lunar eclipse visible in Palestine, and it occurred twelve and a half weeks, before Passover. As Martin points out, there are other compelling reasons to regard I B.C. as the true date of Herod's death. For example, the War of Varus, known to have followed Herod's death, can be redated to 1 B.C., where it fits the other known facts perfectly. In those days, a decree went out from Caesar Augustus that all the world should be enrolled....And all went to be enrolled, each to his own city. This enrollment, described in the Gospel of Luke, which brought Joseph and Mary to Bethlehem, always has been a mystery since no regular taxation census occurred at this time. But the "pater patriae" enrollment fits perfectly. To track heavenly events at the time of Jesus Christ, we first have to estimate when the baby Jesus was born. December 25 was chosen by Christians who didn't celebrate the birth of Christ until 350 years after it happened. In the year AD 274, when the winter solstice fell on December 25, the pagan Roman emperor Aurelian proclaimed December 25 as Natalis Solis Invicti, the festival of the birth of the invincible sun. In AD 354, Philocalus wrote a Christian martyrology that dates the nativity of Jesus Christ on December 25, and cites an earlier work as backup. From this we can deduce that Christmas was celebrated on the present date as early as AD 335 in Rome. It may be that Christmas was set on this day to supplant the pagan feast, or it may simply be a coincidence. Hippolytus and Tertullian, two early church fathers who lived before the Nicene Council set up our present method of determining the date of Easter, used March 25 as the date of Easter. If this is also the origin of considering March 25 to be the date of His conception, then it is possible that December 25 was calculated from March 25 (instead of the other way around) so that Christmas might be older than the Natilis Solis Invicti. However, there is no evidence dating earlier than AD 335 that Christmas was even celebrated, let alone on December 25. Other reasons are perhaps because of its closeness to the winter solstice, the shortest day of the year, and the Roman feast of Saturnalia. There have been several attempts to date the events in Christ's life by reference to astronomical phenomena. Since he was certainly born before the death of Herod the Great, much has been made of Josephus' statement that Herod died shortly after an eclipse of the moon visible from Jericho. Most chronologists, following the lead of the great Johann Kepler, have assumed that the relevant eclipse was that of March 13, of the year 4 B.C. Yet it has been known for centuries that there were several other eclipses, one as late as January 10 of 1 B.C., that could also qualify (Mosley 1987 and Sinnott 1986). Regrettably, it must be concluded that the astronomical evidence on this point is inconclusive and that we must rely on other indications for the date of Herod's death. And unfortunately, there is a substantial difference of opinion on this point (Martin 1978). A somewhat similar situation exists concerning the date of the crucifixion. While the correlation between date of the month and day of the week offers only two prime candidates (April 7 of A D. 30 and April 3 of A.D. 33),the latter has been considered preferable because of a possible connection with a lunar eclipse supposedly seen from Jerusalem on that date. But Ruggles (1990) has recently shown that there is actually no astronomical reason to choose between two dates. And, in any case, there is some uncertainty as to Christ's age at his death. Another astronomical approach to the problem has been to attempt to determine the nature and hopefully the time of appearance of the "Christmas Star," the sight of which inspired the wise men's visit to Israel (Hughes 1979). In this connection it is well to refer to Matthew's exact words concerning this phenomenon. I quote from the 1961 New English Bible: "After his birth astrologers from the east arrived in Jerusalem, asking, `Where is the child who is born to be king of the Jews? We observed the rising of his star, and we have come to pay him homage.'" And again: "They set out at the king's bidding; and the star which they had seen at its rising went ahead of them until it stopped above the place where the child lay. At the sight of the star they were overjoyed." There are at least two important points raised by this account. First, the "star" apparently had meaning only for the astrologers; no one else is reported to have seen it. And second, it is implied that the astrologers had lost sight of the "star" during their trip from their homeland (Babylon? Persia?) to Jerusalem, but that they then saw t again on their way to Bethlehem. The fact that the "star" was not generally seen gives considerable credence to the idea that what the astrologers observed was not a conventional star like a nova or a supernova but rather what may be called a "sign in the heavens" such as a conjunction, or close approach, of two or more planets. And if indeed, a planetary conjunction was meant, it appears that the same planets were involved in two conjunctions, occurring several months apart. Now the idea that planetary conjunctions are involved in the "Christmas Star Problem" has ancient roots: Kepler, while believing that the "star" was a newly-appeared celestial object, nevertheless thought that its coming was associated with several planetary conjunctions involving Jupiter, Saturn and Mars (Burke-Gaffney 1937). Some two hundred years later the idea that planetary conjunctions alone were involved became popular through the work of Ideler. One of the more noteworthy suggestions was that of Stockwell (1892) (actually of the writer's own institution!) 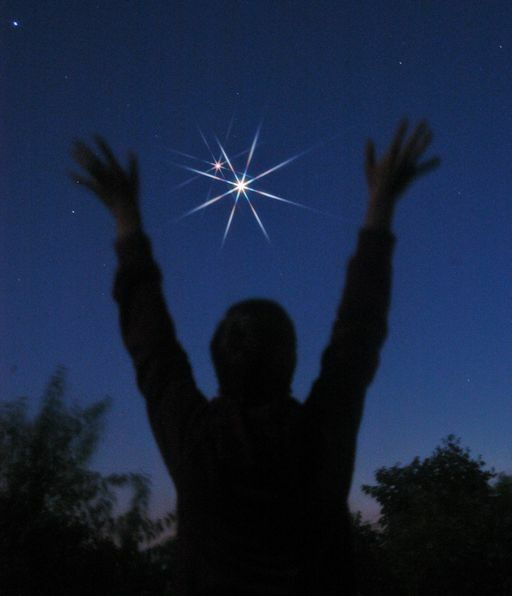 that the "star" was a moderately close approach of Venus and Jupiter on May 8 of the year 6 B.C. Stockwell believed the death of Herod to have occurred in 4 B.C. and also considered only morning conjunctions. His suggestion was roundly criticized on several grounds by Swift (1893) who, interestingly enough, noted that Stockwell's conjunction could not have accounted for the astrologers' second sighting. The solution to the problem came, in the writer's view, from the discovery by Sinnott (1968) of two notable conjunctions of Venus and Jupiter revealed in the extensive planetary tables of Tuckerman (1962). Both occurred in Leo. The first of these was a close morning conjunction on August 12 of 3 B.C. which Mosley (1987) has shown to have been only about 4.3 arcminutes in separation, while the second was an extremely close (0.5 arcminutes) evening conjunction on June 17 of 2 B.C. Sinnott and others have assumed that it was the second conjunction that led to the astrologers' trip to Jerusalem, but the writer prefers the scenario envisaged by Federer (1968), the longtime editor of Sky and Telescope magazine, who equated the ten-months interval between the sightings with the travel time from the astrologers' homeland to Jerusalem. If one accepts Federer's interpretation, then the date of the astrologers' visit to Bethlehem can be precisely stated to have been June 17 of the year 2 B.C. This can be true, of course, only if a later date for the death of Herod can be shown to be valid. But even if this is so, are we now much closer to the date of Christ's birth? Unfortunately we are given no definite information on the age of the "child" when the astrologers arrived. It may be inferred, however, from Luke's account of the parents' visit to Jerusalem to present the child to the Lord, which could not have occurred until at least 40 days after his birth, that this visit must have been made before the arrival of the astrologers, since the Holy Family apparently left for Egypt very soon after that time. Consequently a reasonably accurate estimate of the time of the birth of Christ would be in March or April of the year 2 B.C., perhapspure speculationaround the time of the Lyrid meteor shower. It is difficult to put the birth much earlier in the year in view of Luke's testimony concerning the shepherds in the fields, which seems to imply that Christ was not born in the winter. It may be suggested, then, that the bimillenary birth date might be, say, April 1 of the year 1999. Two closing comments: (l) the writer has recently shown (Observatory 111, 121) that pairs of morning and evening conjunctions such as those described by Sinnott are actually very common. In fact whenever a Venus-Jupiter morning conjunction of more than 19· elongation occurs, it is followed about ten months later by a similar evening one. Unknown both to Stockwell and to Swift, an evening conjunction occurred on March 9 of 5 B.C. While it would be attractive to those preferring an earlier death date of Herod to assume that the 6 and 5 B.C. conjunctions were involved in the astrologers' visit rather than the later ones, this would put the birth of Christ rather early in the year; also it is unlikely that Herod would have been at his palace in Jerusalem in early March rather than in his usual winter quarters in Jericho. And (2) it appears probable to the writer that the reason that Luke's narrative of the Christmas story differs so significantly from Matthew's (in not mentioning the astrologers, the "star," or the flight to Egypt) may simply be that Luke was anxious to disassociate astrology completely from his account of the origin of Christianity, whereas Matthew was not so sensitive on that point. This question can best be left to the theologians! To further complicate matters, our system of numbering years isn't totally accurate due to an error by a monk named Dionysius Exiguus. In 525 AD, Exiguus devised the system of numbering years since the birth of Christ. (AD emerged from the Latin "anno Domini," which means "since the birth of Christ"; BC means "before Christ"). When the monk was counting back through history, he left out four years during the rule of Octavian. He also left out the year "0". Octavian, Julius Caesar's stepson, was the Roman leader from 27 BC to AD 14. Without the four years Exiguus omitted, Jesus' actual birth date would be around 4 BC. A variety of supporting evidence (such as the reign of Herod, who died in 4 BC and details of Roman censuses) indicates that between 5 and 7 BC is considered to be the most likely time for Christ's birth. In 5 BC, Chinese sky watchers saw a "broom-star," a comet with a tail that seemed to sweep the sky. Colin Humphreys, a researcher at the University of Cambridge in England, thinks it was this celestial fireball, which probably looked much like Comet Hyakutake, that guided the three wise men on their journey. The Chinese observers saw the comet for 70 days, plenty of time for the wise men to reach Jerusalem from their homes in Persia, Humphreys claims. The biblical Matthew's description of the star of Bethlehem, "lo, the star, which they had seen in the east, went before them, till it came and stood over where the young child was," could easily describe a moving comet. It is too ambiguous to make possible a definitive identification with known astronomical phenomena of that era. However the wise men were astrologers. Rather than comets, they would be probably be much more interested in the movements of planets and what those movements meant to humans. In 7 BC, a planetary dance occurred that would capture the interest of any astrologer. Astronomers have proposed conjunctions of some of the planets as a likely explanation of the 'star.' Once every 139 years, Jupiter and Saturn share the same small patch of space when viewed from Earth. In 7 BC, Jupiter and Saturn could be seen rising together at the instant the sun set. Jupiter, Saturn, and Mars in 6 BC; and Jupiter and Venus in 3 BC. Other possibilities are appearances of comets in 5 BC and 4 BC, and a nova (exploding star) in 5 BC. In 3 B.C. and 2 B.C., when there was a series of close conjunctions involving Jupiter, the planet that represented kingship, coronations, and the birth of kings. In Hebrew, Jupiter was known as "Sedeq" or "Righteousness", a term also used for the Messiah. September 11, 3 B.C., is perhaps the most interesting date of all. Not only was Jupiter very close to Regulus in the first of their conjunctions, but the sun was in the constellation of Virgo (of obvious symbolism), together with the new moon, in a configuration that fits a plausible interpretation of a passage in the Book of Revelation describing the birth of a male child who is to be the ruler of the universe. Significantly, September 11, 3 B.C., also marked the beginning of the Jewish New Year, traditionally regarded as the anniversary of Noah's landing after the Great Flood. The answer is yes. The word "stop" was used for what we now call a planet's "stationary point." A planet normally moves eastward through the stars from night to night and month to month, but regularly exhibits a "retrograde loop." As it approaches the opposite point in the sky from the sun, it appears to slow, come to a full stop, and move backward (westward) through the sky for some weeks. Again it slows, stops, and resumes its eastward course. It seems plausible that the Magi were "overjoyed" at again seeing before them, as they traveled southward, the star, Jupiter, which at its stationary point was standing still over Bethlehem. We do know for certain that Jupiter performed a retrograde loop in 2 B.C. and that it was stationary on December 25, interestingly enough, during Hanukkah, the season for giving presents. Alternatively, there may have been a sighting of the then unknown planet Uranus, which, though faintly visible to the naked eye, was not discovered until AD 1781. lf the appearance of the 'star' was a miracle or a myth, astronomical explanations are unnecessary and invalid. David Hughes, a researcher at the University of Sheffield in England, said the simultaneous rising of Saturn and Jupiter against a backdrop of the constellation Pisces would have special meaning for the wise men. Pisces was the zodiac sign representing the Jews, Jupiter was the king of the gods, and Saturn symbolized both justice and the land of Palestine. Hughes wrote that this meeting of planets within a constellation was "obviously a sign associated with the coming of a Jewish Messiah." But Matthew mentions a star in the Bible, not planets. Henbest suggests Matthew could have made up the tale of the star to enliven the story. Or maybe the guiding star was a miracle, the result of divine intervention. In our calendar we count years from an assumed year of the birth of Christ, as determined by Dionysius Exiguus (circa AD 530) from a study of historical records. Dionysius was commissioned by Pope John I to calculate dates of Easter for future observances. Rather than dating these from the first year of the reign of Diocletian, as was the custom of the time, he chose to 'number years from the Incarnation of Our Lord Jesus Christ.' However, several centuries elapsed before this practice was commonly used in Europe. Use of the Christian Era was popularized by the writings of the Venerable Bede, the English historian and saint of the eighth century, though Bede questioned the accuracy of Dionysius' dating. Celebrations of the birth of Christ date back at least to the third century AD. Until the fifth century, however, December 25 was not commonly accepted as the date for the celebration. This date follows closely the winter solstice, when the Sun reaches its most southerly point in the sky and begins to head north. It was a time of celebration for pre-Christian societies in the northern hemisphere. By adopting December 25 the Church successfully amalgamated ancient tradition with new religious practices. a) It was a star which had newly appeared. However, the Matthew not remark that it was unusually bright. Although it was significant for the Magi, Herod did not mention seeing it. b) The star was referred to as a single object. d) The star "stood over" Bethlehem. e) How about the time of the year? The best clue is a passage in the Book of Luke: And there were in the same country shepherds abiding in the fields, keeping watch over their flock by night. If the reference to "fields" is accurate - not pastures or holding pens - we might guess at a date in late summer or early fall, for it was customary for farmers to allow sheep and cattle to graze the stubble in the fields following the harvest. This clue is suggestive, but hardly definitive. It is important to consider several other pieces of background information. The Magi: The Magi are thought to be a priestly group in the Persia-Babylon region who became associated with astronomy and astrology. There was a strong Jewish colony in Babylon which was familiar with Biblical prophecies. The Magi probably knew of theprophecy of a Messiah. The journey time from this area to Jerusalem is thought to be 1 - 2 months. Theory 1: A nova in March-April of 5 BC. A nova is a white dwarf (an old, shrunken star which has used up its nuclear fuel) which is in a close, mutual orbit with a larger star. The white dwarf pulls material off from its partner star. From time to time, enough material accretes to provide sufficient pressure for a thermonuclear explosion, causing an increase in brightness of the white dwarf by up to a factor of 50000. Chinese astronomers recorded a new star in Capricorn in March-April of 5 BC which was visible for over 70 days. This object would have appeared in the east several hours before sunrise. It is unclear whether this was a comet or a nova. No motion was recorded. A rayed appearance could have arisen from distortions within the human eye for a sufficiently bright object. There is no record of the brightness of the star, but a typical nova which is visible to the naked eye could be seen for as long as seventy days, about the journey time of the Magi. Capricorn is in the direction of very few stars in our Galaxy, so the probability of a nova in that direction is low. The astronomer Foucquet in 1729 proposed that the star was a nova, although there is evidence that the German astronomer Kepler first suggested the idea in 1614. The hypothesis is still under debate today. Theory 2: A comet in March-April of 5 BC. Comets in antiguity were regarded as heralding important events. The Chinese called comets "broom stars" on the account of their tails, and thus they have been associated with "sweeping away the old order of things." The same "new star" described by the Chinese astronomers in 5 BC might not have been a nova, but instead could have been a comet. Such an object could travel slowly against the background stars, and also be visible for up to several months. It is suggested that the Magi originally saw the object in the east in the morning sky. A month or two later, when the Magi went from Jerusalem to Bethlehem, they then would have seen the star ahead of them (to the south). It is quite possible for a comet to travel 1 - 2 degrees per day in order to swing 90 degrees from east to south during the journey of the Magi. Halley's comet made an appearance in 12 BC but this is outside the range of probable dates for the birth of Christ. The first recorded connection of the star with a comet is from the monk Origen c. AD 248, and the theory is still open to debate. Theory 3: A planetary cause. The Magi would have predicted the triple conjunction of 7 BC and realised its significance. During the first encounter of the triple conjunction in late May of 7 BC, when Jupiter and Saturn were two Moon widths apart, the Magi could have set out upon their journey. The second encounter of the triple conjunction in late September would have appeared as they reached Jerusalem. The third encounter, in early December after a presumed audience with Herod, would have appeared in the south towards Bethlehem. However, in this conjunction Jupiter and Saturn were never close enough together to be confused as a single object. The Jewish astrologer Masha'allah c. AD 800 proposed the star to be associated with the conjunction, and today there is still active debate on the subject. A variation of this theory proposed in 1992 by the British academic Bulmer-Thomas is that the star simply was the planet Jupiter passing through a stationary point as viewed from Earth. This arises from Earth catching up with and then overtaking Jupiter, as Earth travels more quickly in a smaller orbit around the Sun than does Jupiter. The giant planet would appear to stop, move backwards for a time, stop again, and then move forward in its usual direction. The stationary points appear to last for about a week as judged by the human eye. There is abundant evidence from hundreds of cuneiform texts that such motions were of keep interest to Babylonian astronomers of the time. The Magi in their journey from the east to Jerusalem and Bethlehem were simply observing the motion of the planet, and were at Bethlehem when Jupiter arrived at a stationary point. To strengthen the case for the star being Jupiter, the Greeks and Romans both used the word "Saviour" in reference to Jupiter. The Greek word for "above" used in St Matthew's Gospel is a very general term, and could just mean that the star was somewhere in the sky above Bethlehem. The triple conjunction of 7 BC and the grouping of Mars, Jupiter and Saturn in 6 BC would have alerted the Magi to look for a further sign in the sky. If they were to follow Jupiter from the time it emerged from behind the sun in May of 5 BC, four months later (consistent with their journey time) they would have seen it pass through a stationary point. The date would be consistent with other biblical information. The ambiguity of the ancient astronomical descriptions and the uncertainty in the date of Christ's birth make it difficult to judge the true nature of the Star of Bethlehem. I would consider the nova in 5 BC theory somewhat unlikely considering that its location in Capricorn is some 40 degrees from the plane of the Milky Way, which is where most novae are observed. Such an object also would not move with respect to the stars, although in the Gospel it is unclear whether the star actually did move. The comet theory allows for movement, but the Chinese did not record any such motion for the new star of 5 BC. It is difficult to ascribe the star to the conjuction of Jupiter and Saturn as they were never close enough to be seen as a single object, while the Gospel never mentioned any multiple nature for the star. The hypothesis that it was Jupiter passing through a stationary point has difficulty in explaining that it was a new star -- rather, Jupiter was well known. However, St Matthew wrote that Herod asked the Magi "when the new star appeared" (Mt 2:7). This could have been simply in reference to Jupiter's arising from behind the Sun. This would make Jupiter the most straightforward explanation for the event, especially in light of its astrological significance. Lastly, it is possible that the star grew out of legend. No king of any note in that time was born without some celestial manifestation. St Matthew, writing for a Jewish audience, may have felt that a star was necessary to fulfill a prophecy from the Old Testament (Numbers 24:17). He did not add the typical phrase "that it might be fulfilled" in reference to the star, which weakens its case as a historical fact. Whatever the explanation for the Star of Bethlehem, or whether it even existed or not, it does not take away from the theological mystery of the Christmas story. Little did St Matthew know that his description of the star would keep astronomers and historians busy for 2000 years. On 7-25-2001, I was walking around the house, doing laundry, making dinner early before the heat of the day started to raise too uncomfortably to cook and put the food in the refrigerator to keep cool. I went to the bathroom and before I even did anything, a booming voice came into my head with the words: SOL INVICTUS. In the Roman world, December 25 was considered the Birthday of the Unconquerable Sun, the Natalis Solis Invicti. Each year a feast took place just after the winter solstice of the Julian calendar, in honor of the Sun God, Mithras. By the year A.D. 274, Mithras had become so popular that the cult of Sol Invictus was proclaimed the Roman Empire's official state religion....Meanwhile, other pagan forces were at work in Rome. From December 17 to 23, Romans celebrated the ancient feast of the Saturnalia, a time of jubilation. The period commemorated the golden Age of Saturn, the pagan god of sowing and husbandry. It was the name of the Sun-god, Sol Invictus, that appeared on one side of the coins Constantine minted. On the other side appeared the name of Christ. Just as Constantine's coins intermingled paganism with the name of Christ, so also many of the feasts and rituals of paganism were intermingled with Christian, or pseudo-Christian, terminology. Such was the origin of Christmas. The emperor Constantine, contrary to tradition, was not a Christian but an advocate of the cult of Sol Invictus. More for political expediency than for religious reasons, Constantine tolerated Jesus as an earthly manifestation of Sol Invictus, the son god. Since Christian doctrine was being promulgated by Rome, compromises were being made between Christianity, Sol Invictus and Mithraism. Constantine saw this as a way of maintaining harmony. An edict by Constantine in 321 CE ordered the courts to be closed on the "venerable day of the sun" and Sunday was chosen as the day of observance rather than the traditional Saturday Sabbath. In Prague, in 1603, shortly before Christmas, the astronomer and mathematician, Johannes Kepler, was making observations of the stars through his rudimentary telescope. He was observing the conjunction of Jupiter and Saturn in the constellation of Pisces. The two planets had converged to look like one larger and new "star." Kepler later remembered something he had read by the Rabbinical writer, Abravanel (1437-1508). Jewish astrologers maintained that when there was a conjunction of Saturn and Jupiter in Pisces, the Messiah would come. In ancient Jewish astrology, the constellation of Pisces was known as the House of Israel, the sign of the Messiah. Jupiter was the royal star of the house of David and Saturn was the protecting star of Israel, the Messiah's Star Since the constellation of Pisces was the point in the heavens where the sun ended it's old course and began its new, it is understandable why this conjunction would be viewed as a portent of the Messiah. Kepler concluded that he had found the "star of Bethlehem" but his hypothesis was rejected. It was not until 1925 that the hypothesis was re-examined when references to this conjunction were found in the cuneiform inscriptions of the astrological archives of the ancient School of Astrology at Sippar in Babylonia. Sippar was an ancient Sumerian city lying on a canal which linked the Tigris and Euphrates rivers. It was a very important commercial and religious center. Excavations at the site of Abu-Habbah during the latter part of the 19th century unearthed the remains of a temple and ziggurat dedicated to Shamash and the ancient scribal School of Astrology. The most important discovery were tens of thousands of clay tablets from the school archives that dated from the Old Babylonian and Neo-Babylonian periods. In 1925, the German Scholar P. Schnabel found, among the endless cuneiform records of dates and observations, a note on a conjunction of Jupiter and Saturn in the constellation of Pisces. The position of Jupiter and Saturn, converged in Pisces, had been recorded over a period of five months in 7 B.C.E!! Calculations show that the conjunction was observable three times over the course of the year, May 29, October 3, and December 4. EN TH ANATOLH "in the east" from the original wording which means idiomatically, "the first light of dawn" (which comes from the east) when the conjunction is visible. The correlation of this celestial event with the first visit of Quirinius and a preliminary registration in Syria is too much of a coincidence for this layman to ignore. This makes the Gospel account accurate. Accepting the Star of Bethlehem as an historical fact, detective work gives us three possible dates for the birth of Jesus, May 29, October 3, and December 4 in the year 7 BCE. We must rule out May 29 as too early. scholars also contend that the Gospel account of the three "Wise Men" is another of those theologoumenon white lies. If one were to accept the story of the three magi (astrologers), or at least three visitors who came to Judea based on the astrological omen, as containing an element of fact, May 29 is too early. Why would "wise men," astrologers/magi in Babylon care about a celestial event predicting the Jewish Messiah? Christians are normally unaware that Babylon was as important a center for Judaism as Jerusalem in the ancient world. It is the center for the predominating Babylonian Talmud. It is very likely that the "wise men" were scholars of the School of Astrology in Sippar and likely of Jewish ancestry dating to the mass deportations of Jews to Babylon in the 7th century BCE. Steeped in their Jewish messianic hopes and in astrology, these men would have been convinced that the birth of the Messiah was imminent. Given their background, an expedition to the Homeland would seem the most likely course of action for validation of both their scholarly, astrological and religious prognostication. These astrologers would have observed the first conjunction on May 29 and then made preparations to travel to Judea, arriving for the time of a predicted second conjunction. October 3 intrigues me because it is within days of the time of other recorded Roman censuses. Including the one in 6 CE. December 4 would be too late for Shepherds to be tending their flocks. These were usually brought in around the first of November. With all respect to the New Testament scholars, this historical story, correlating the Gospel accounts of the registration with the celestial phenomenon, Saturday, 10 Tishri, 3755 (October 3, 7 BCE.) is the date of the birth of Jesus. Interestingly, that day was a Yom Kippur, the Day of Atonement. The two stars, Zeta 1 and Zeta 2, are located in the southern constellation of Reticulum (the net) and are thus never visible to most of the northern hemisphere . HERCOLUBUS - Dreams of the Great Earth Changes - PLANET X? The five-pointed star is the signet of Vishnu, in India. .... Revelation 9:1 And the fifth angel sounded, and I saw a star fall from heaven unto the earth: and to him ..
www.greatdreams.com/walkin.htm - Similarto WHAT IS A WALK-IN AND WHAT DO THEY DO? Either we present the factual evidence that gravity is inexorably pulling this dwarf startoward our Sun, or else the public will remain in unknowing peril. that out of 3 sounds are framed not a 4th sound, but a "star", we find that this results from a creation by way of "acoustic bass", as this is known technically.